SGIA recently introduced a new printing industry color certification, called SGIA Digital Color Professional. RPImaging is hosting this training class to teach the best methods for color managing printing devices, and preparing attendees for qualification and/or certification in SGIA's program. Each attendee will receive a link to take the SGIA Digital Color Professional Exam, within 2 weeks of the class. If you pass the written exam, you will receive SGIA Qualified Digital Color Professionals Certification. After achieving Qualified status, the Qualified SGIA Digital Color Professional will take a SGIA test image back to their facility and use the hands-on knowledge they’ve gained in the boot camp to color manage their print system and print the test image. To obtain SGIA Certified Digital Color Professionals Certification, they’ll submit the print to SGIA for measurement to a standard that includes industry recognized targets and spot colors for an objective analysis of the print. After passing the exam, free control print submission to SGIA to be measured against standard color industry targets and spot colors. 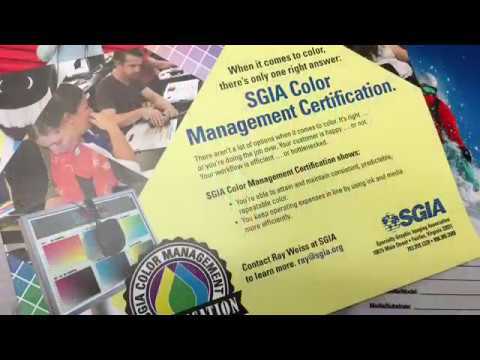 Where can I find SGIA Onyx Color Management Boot Camp? Minimum class size requirements must be met 2 weeks prior to the workshop start date. Please DO NOT make your travel plans until the class is confirmed, you will be notified via email. You will receive a full refund if the minimum class size is not met. No refunds for cancellations within 10 days of the scheduled class start date.